.Badminton is a great sport to become proficient in, not just because it is fun and a terrific form of exercise, but also because it can be played at a backyard party just as easy as it can at the local recreation center. Though Badminton is a racquet sport with rules similar to those in tennis, it is absolutely its own sport. The court is roughly half the size of a tennis court, and when you play badminton and realize how fast the shuttlecock/birdie can move at its top speed, you will understand why. Because of these factors, badminton can be tough to master, even if you are already a skilled tennis player. Consider heeding the tips below to start vanquishing your opponents more quickly! Save face with fellow badminton players by knowing what you're talking about, at least mostly. The biggest piece of terminology is the feathery projectile used in place of a ball. 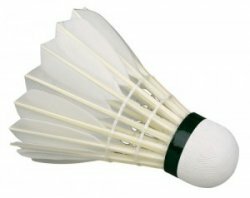 This?thing is called a "birdie" (in North America) or a "shuttlecock" (most other parts of the world) and is the obvious center of any badminton match. Knowing other terms?like "carry," "wood shot," "home position," and "clear"?won't just help you to discuss badminton with your teammates and opponents, but will also help you to understand the game. The English Club has a pretty helpful glossary of badminton terms to help you get familiar. One of the most common mistakes among beginning badminton players is holding the racquet incorrectly. Impulsively, you might want to clutch the racquet rigidly in your hand. This grip is incorrect. Instead, you want to have a more relaxed grip, with a loose and flexible wrist. Most badminton coaches would instruct you to find the standard grip by pretending you are "shaking hands" with the handle of your racquet. If you are confused, ask a fellow player to show you how to hold the racquet, as well as to demonstrate their forehand and backhand strokes. As mentioned above, a badminton court is small enough that you can set up a makeshift version in your backyard. While this option is fine for parties or leisurely play, the fact is that you aren't going to get the best experience playing a makeshift court?or outdoors at all, for that matter. Unlike with tennis, where playing outdoors is arguably more fun (depending on who you ask), all serious badminton players will tell you that indoor play is the only way to go if you want to test your skills and be competitive. The problem with the outdoor play is the wind, which can easily tend the lightweight birdie/shuttlecock barreling off course. Even on a day with a light breeze, it can be tough to get a good volley going. Like in tennis, you want to return to the center of your play area between every volley. The home position will be different depending on whether you are playing singles or doubles, but by staying at the center of your play area, you will have a better chance of returning all (or most) volleys. As mentioned above, the shuttlecock can get moving considerably faster than a tennis ball at its top speed, so being left or right of your home position can make it quite difficult to return a well-placed shot from your opponent. If staying in the center of the court makes returning volleys easier, it stands to reason that you want to force your opponent to run backward or sideways on the court to return your shots. Don't return volleys to the middle of the court or the same spot every time. Instead, alternate where you are aiming between the front and back and left and right parts of the court. This tactic will tire out your opponent and make it more difficult for them to get back to the home position before your next volley.